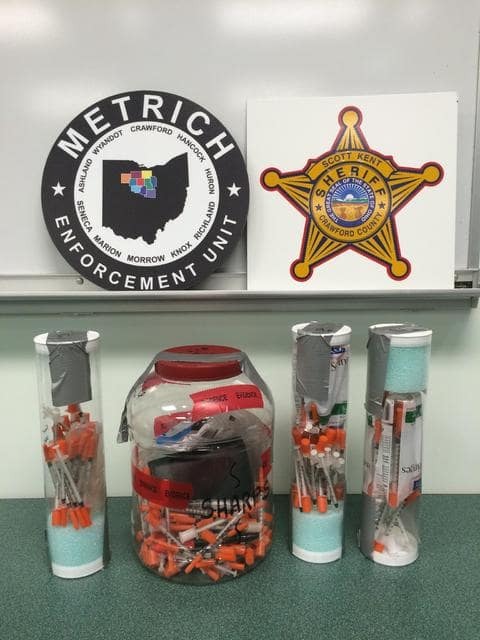 Two Galion residents were arrested this morning following a heroin trafficking investigation. According to reports, a search warrant was performed at 8:18 this morning by The Crawford County Special Response Team, which is made up of officers from the Crawford County Sheriff’s Office, Bucyrus & Galion Police Departments, Bucyrus and Galion Fire Departments and the METRICH Enforcement Unit at a 520 First Avenue home in Galion. Officials said heroin, persctipion drugs, syringes and drug paraphernalia were recovered during the search. Reports indicated Robert Nead Jr., 41, of the residence, was arrested on a trafficking in drugs (Heroin), while LaRonda Clark, 39, also of the residence, was arrested on charges of possessing drug abuse instruments and permitting drug abuse. Here is the 520 First Avenue home in Galion. http://aimmedianetwork.com/wp-content/uploads/sites/38/2015/08/web1_drugs2.jpgHere is the 520 First Avenue home in Galion. Here were the items reportedly found during the search. http://aimmedianetwork.com/wp-content/uploads/sites/38/2015/08/web1_drugs11.jpgHere were the items reportedly found during the search.